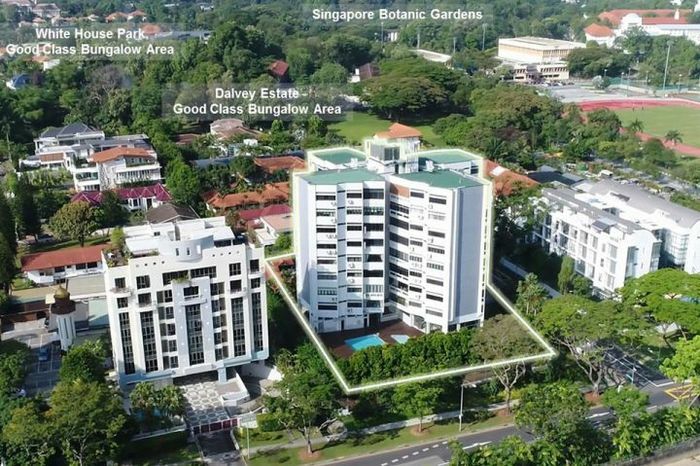 DALVEY Court owners have put the condominium development near the Singapore Botanic Gardens up for collective sale with a reserve price of S$160 million, according to a press statement on Monday. The freehold, nine-storey building in District 10 comprises 32 apartment units on 4,103.1 square metres, or 44,165 square feet, of land off Bukit Timah Road. The site is zoned "residential" under the Urban Redevelopment Authority's Master Plan 2014, and may be built up to 1.6 times the site area, also known as the plot ratio. There is a 12-storey height control on the site. The reserve price represents a land rate of about S$2,009 per square foot per plot ratio, based on a gross floor area of 7,400.69 sq m, or 79,660 sq ft. Marketing agent Cushman & Wakefield estimated that a potential developer may build up to 93 apartments based on an average unit size of 70 sq m. There is no development charge payable for the site, and no requirement for a traffic impact study. Besides being close to the Botanic Gardens, the site is also near to the stretch of high-profile schools along Bukit Timah Road that includes St Joseph's Institution, Singapore Chinese Girls' School, Anglo-Chinese School (Barker Road) and Nanyang Primary School.